I am often asked how is it possible that herbs come in so many disorienting scents and flavours such as basils in unlikely lime, lemon and camphor versions, geraniums in orange, rose and coconut, and mints overstepping boundaries in lemon, ginger and banana varieties. Did somebody take genes from a banana and combine them with a mint plant? With these and many other scented oddities it is easy to see why people might think that something is amiss in the herb patch, whispers even of herbal GMOs foisted on the gardening public! Let me reassure you that none of these herbs are GMOs, or genetically modified organisms. They truly are Mother Nature’s gifts and we humans only need to find them and grow them…..It helps to understand a little about the olfactory phenomenon at work that gives rise to the sensation of scents. Scented plants are rich in essential oils. When the leaves of these plants are rubbed or when a flower opens, these oils are released to the air….. He writes that essential oils are not a single component, but rather combinations of component chemicals. It’s these mixtures that give us the familiar scents of “orange”, or “banana”. Let’s look at one of the imposter lemon herbs, lemon verbena. Anyone who has had the pleasure of taking in the intoxicating scent of fresh lemon verbena leaves knows that it has the unmistakable character of lemon, but it is definitely not the same as lemon. I regard the scent and flavour of lemon verbena as a major refinement on the best that the lemon tree can produce. It’s a sort of olfactory one-upmanship that makes the herbal world so endearing to many of us. To my nose, there is a regal exuberance in lemon verbena that is missing in lemon oil, as if Mother Nature decided to fill in the gaps after its first try at creating the lemon scent. 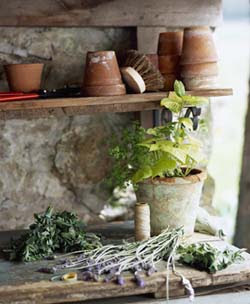 Read Conrad Richter’s article, The Many Splendored Scents of Herbs, here. I would be very much interested in acquiring a lemon verbena plant. 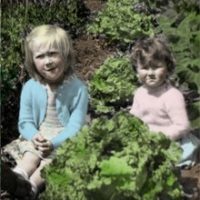 Do you know of a source here in the Toronto area? Sorry to say, it’s difficult to find a place in the city proper to buy the rarer herb plants. That’s why I made the pilgrimage to Richters. Humber Nurseries on Hwy 27 south of #7 Highway has a good herb selection, I know they would have it. It’s not quite as far as Goodwood. Loblaws and other stores with garden centres will have some herbs available in the spring, but Lemon Verbena might not be one you’ll find. But maybe this year, they’ll expand their offerings. East of Eliza on Gerrard in the east end has some rarer herbs as well, but they might not have much in stock till the spring. Sarah, thank you…both of your suggestions proved positive and they both carry lemon verbena. Humber has some on hand now, E of Eden later in early May.